Thursday evening, about one hundred mostly Brooklyn based bloggers, including me, gathered at the Old Stone House for the second annual Brooklyn Blogfest, organized by Louise Crawford of Only the Blog Knows Brooklyn. * In addition to bloggers, representatives of mainstream media, including the New York Times and Washington Post, were there. The Times reporter had to sit through some barbed criticism of the Grey Lady's coverage of Brooklyn in general ("they report the murders and the fires, but not the interesting stuff", complained one blogger) and the Atlantic Yards development (for my nuanced view on this issue, let me tax your attention span here). 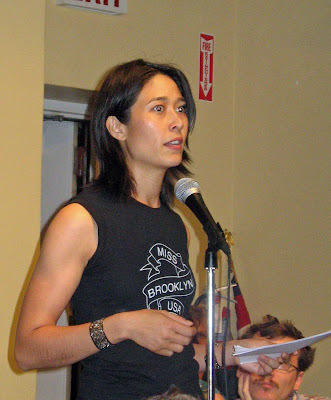 Three of the featured speakers, Lumi Michelle Rolley of No Land Grab (photo above), Robert Guskind of Gowanus Lounge and Norman Oder of Atlantic Yards Report, all oppose the development, although Gowanus Lounge is not primarily, or even mostly, an anti-Yards blog. 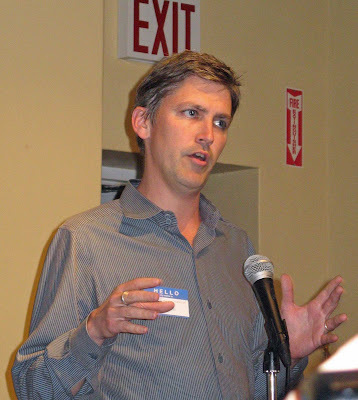 Writer Steven Berlin Johnson (photo above), who has his own blog, spoke about his new project, outside.in, the object of which, he said, is to "organize the web geographically." The site allows you to find your location on a map, click on it and see what local bloggers are discussing. Johnson tested it on a recent visit to Denver, where he located his hotel and discovered that the hot topic in that neighborhood was the architect Daniel Libeskind, best known in New York for his master plan for the World Trade Center site. Reading some of the local chatter, Johnson learned that Libeskind had designed the recently completed addition to the Denver Art Museum. He then went to the window, pulled the curtain open, and saw that very building in front of him. Johnson also talked about his recent survey that rated Clinton Hill, Brooklyn as America's bloggiest neighborhood. He admitted that he had fudged the results in one way: had he listed the top ten localities in order, six of them would have been in Brooklyn. Since he wanted more geographical diversity in the list, he decided to include only the top Brooklyn entry. He said the most salient common factor of "bloggy" neighborhoods is gentrification; of the top ten, six are undergoing that process. After the formal program, bloggers gathered downstairs to socialize over margaritas and Mexican snacks. This gave me a chance to meet Gary, of runs brooklyn/brooklyn runs and his wife, Kate. (Thanks for the kind mention on your blog, Gary. Astrophysics is always exciting; I'm hoping that the condition of the Mets' starting rotation doesn't become so.) I also had a pleasant chat with Pastor Daniel Meeter of the Old First Reformed Church, who turned out to be something of a train buff, and learned of his blog, Old First, which I will add to my links as soon as I have the energy to undertake the tedious process Blogger has created to do this. As it turns out, not only did the Times reporter, Sewell Chan, endure the bashing his paper took; he wrote a comprehensive article about the Blogfest, which was published online. Mr. Chan is surely among the few who think my blog is "delightfully named"; for that, and the mention in his article, I'm most grateful. *The title of Ms. Crawford's blog is a play on the title of a Thomas Wolfe short story (later also used for a novel by Thomas Boyle), "Only the Dead Know Brooklyn". The couple who now own the Cobble Hill house where Wolfe was living in the basement apartment when he wrote that story, Gene and Pam Moore, are friends of ours, and have a daughter, Maia, who is the same age as Liz. As was reported several weeks ago in the Brooklyn Heights Press, one day some years ago Gene was surprised to hear a woman's voice coming through a bullhorn in front of the house. He went outside and found a tour group from Asheville, North Carolina, Wolfe's home town, who were visiting all of the Wolfe sites in New York. Gene, who had Maia (then about four) next to him, invited them to come in and see the basement where Wolfe had lived. Opening the bathroom door, he said, "this is where Mr. Wolfe shaved." For a long time after that, Maia was afraid to go to the basement, for fear she might find Mr. Wolfe shaving. The photo above, taken from Pier 16, shows her departing today, assisted into the East River by the tug Margaret Moran, with Brooklyn Heights in the background. 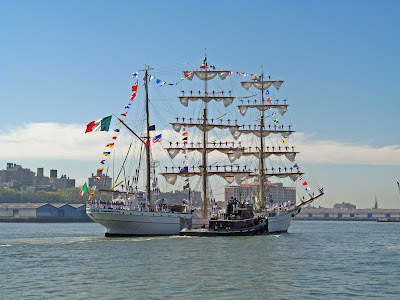 Mariachi music was blaring from speakers on her masts as she sailed, but the sailors balanced on the spars fortunately resisted any temptation to start dancing. ... by the conclusion drawn from this study. Update: For those of you who've followed two different links from WikiFray to this, and discovered posts with two different titles and bodies, except for a link to the same story, what happened was that I rewrote it this morning (5/8) after deciding I didn't have the stomach for a flame war with people who majored in psych. Update down under: Now I'm hoping Gary (see comments) doesn't draw me into a flame war with Aussies. He's not coming the raw prawn, mates, he's just being ironic. Gary, thanks for reminding me about the Blogfest. I will try to attend.